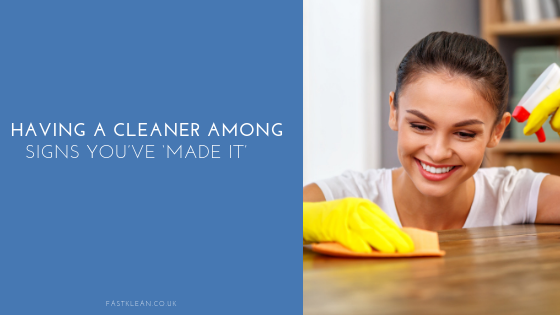 Having a cleaner is one of the top signs that you’ve ‘made it’ in life, according to a new poll. Some 2,000 people were asked about the elements that show a person has got it together and achieved an aspirational lifestyle, with hiring a cleaner coming in at number ten. The research was carried out by PartiStaff and found that having help at home was alongside there always being champagne in the fridge and owning a hot tub. It’s not surprising that outsourcing cleaning services was among the top choices, as it’s a task that many people don’t relish. While having nice things comes high up on people’s wish lists, it’s hard to underestimate the joy that comes from somebody else doing your housework. Even if you dream of living in a huge mansion, your fantasy probably doesn’t include vacuuming large swathes of carpet and dusting the drapes. Even though having a cleaner seems aspirational to many, it doesn’t have to be out of reach. Many households up and down the country hire someone to do the chores for a number of reasons. It might be that both parents work and the cleaning always gets put on a back burner or it could be that busy families would prefer to spend quality time together than mopping and wiping. Hiring a cleaner doesn’t have to be an all or nothing situation either. While it’s great to know that someone will be coming in once a week or every fortnight, some households have help on a less regular basis. It could be a one-off to prepare the home for Christmas or to tackle particular jobs, like carpet cleaning, that are required less frequently. Other signs that a person has ‘made it’ included owning a second home, having your own gym and boasting his and hers sinks in the bathroom. All of these extras would need cleaning, however, so whatever you aspire to, it’s worth putting the cleaner at the top of list. Even hiring a gardener, which came in at number 15 in the research, is less of an aspiration than getting help inside the house. The justification for wanting someone to mow the lawn is having a garden big enough to warrant it, but you’ll need a house to match that garden too and indoor cleaning is a much bigger job. So, if you are ready to hire a cleaner, get in touch with FastKlean. Our team can tackle everything from keeping on top of the home to oven cleaning and ironing services. There are even one-off options if you need to get your place back to normal after a party or before a big event. What are the biggest signs that someone in your neighbourhood has ‘made it’? Let us know in the comments. Great blog! I really appreciate our cleaner and work she does for me and my family. Makes our lives so much easier and we love her. Great post! I think having a cleaner makes such a difference especially if you live a busy lifestyle.